I’ve always been an early riser. Reveling in the calm before the morning storm of breakfast requests and pint-sized demands happens to be something I look forward to. Sometimes, I’ll even force myself out of bed early, just to steal a few caffeinated moments to myself. The other morning, while everyone was fast asleep, I tip-toed downstairs and into the kitchen. I made muffins. Drank coffee (in silence). Watched the heavy snow fall outside. 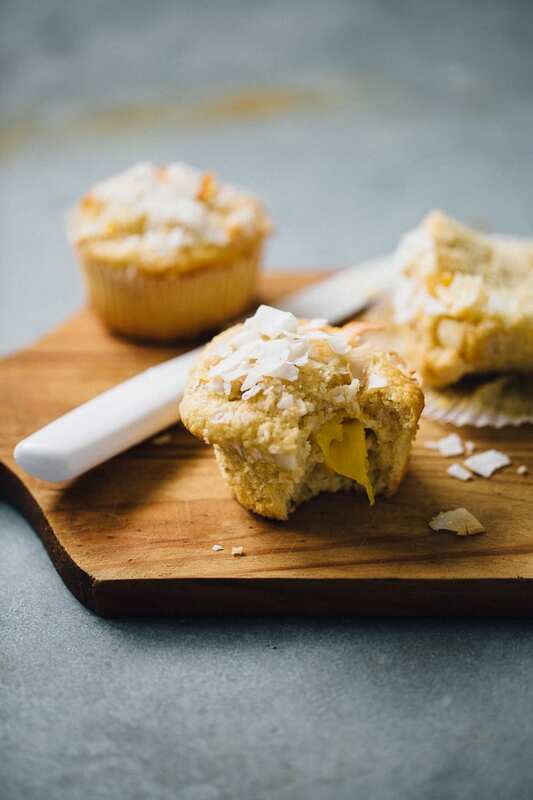 And in between bites of freshly baked coconut mango muffin, I couldn’t help but wonder: was that crunch from the coconut? Or was it an egg shell?! Ever since I learned how to cut a mango properly, I’ve been using them in all kinds of recipes. I love their silky, soft texture bursting with sweetness. One of my favorite things to do, is to cut up a mango into bite-sized pieces and throw them in the freezer. I buy a whole bunch when they go on sale. My kids love frozen mangoes as an after school snack, and they’re great for smoothies. The color of a perfectly ripe mango is absolutely gorgeous too (it makes me want to get a pedicure). 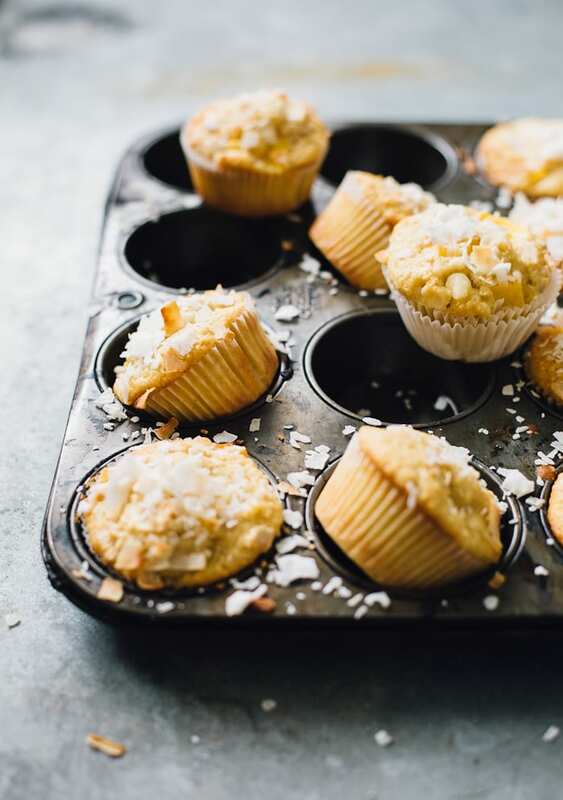 These muffins also include shredded coconut and a few white chocolate chips. They are a tad bit sweeter than the muffins I would normally make, but I was in the mood. Call them a cupcake, if you want. The texture is light, bouncy and would make a fun addition to your baking gig. Oh, and by the way, it was definitely an egg shell! Tips: These muffins are best consumed on the same day as baked (the mango will soften the muffins as the days go on). Substitutions: White chocolate chips add extra sweetness and texture, but if you don’t have any, just leave them out! If you don’t have buttermilk, sometimes I’ll thin out a little bit of yogurt with milk to emulate the texture. It’s not an exact swap, but it works in a pinch. Just make sure the buttermilk and/or yogurt is at room temperature before using otherwise the muffins will be rubbery. Make- Ahead: Pre-measure the dry and wet ingredients respectively, and combine when ready to bake. The dry ingredients will last up to 1 year stored in an air-tight container or ziploc bag. The wet ingredients 1-2 days, chilled (whisk well before using). Preheat your oven to 375 F. Line a muffin tin with baking cups. In a large bowl, sift together the flour, baking powder and sugar. Add the mangoes and toss gently to coat. In another bowl, whisk together all of the wet ingredients until well blended. Gently combine the dry and wet ingredients. 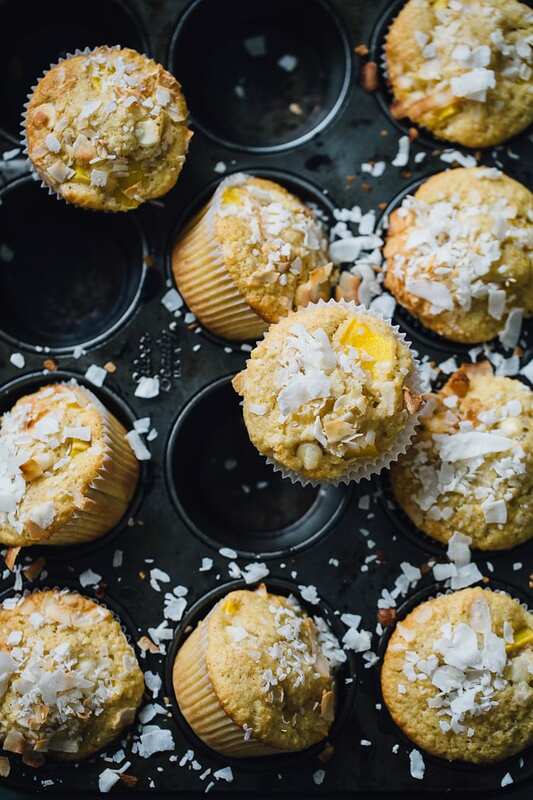 Try not to break up the mangoes or over mix the batter; you will have tough muffins. Spoon the batter into your muffin cups, about ⅔'s full. Sprinkle some of the coconut flakes and white chocolate chips over the top. Bake for 15-20 minutes, or until a toothpick comes out clean when inserted. Cool for 10 minutes inside the tin. Transfer to a wire rack to finish cooling. Ha! Be careful what you wish for, right? Good thing the snow is pretty much melted now. I’m wondering if that will it for us this winter (nothing compares to last winter, ugh). Wishful thinking! Yr muffins look so yummy , great for breakfast but I am lousy riser , so, probably make it for afternoon tea time .,just wondering what is your way of cutting the mango . Thanks for sharing . Hi there! There are a few ways to cut a mango. My preference is to use a mango pitter first to extract the most fruit off of the pit. Then I score the two halves (criss cross pattern) and cut off the cubes. Works like a charm! Baking muffins and watching the snow fall is enough to make me want to be a morning person. I too would love to hear your secrets to cutting mangos. Anything with mango in it has my name written all over it. Buttermilk makes baked goods so much better too. Looking forward to trying the recipe. ahhh I love the chunks of mango in here. I’m a morning person too and would love to rise and shine with these. sounds like the most peaceful morning with muffins in the oven and snow falling – heaven! I’m so craving a bite of these tropical muffins! Mango and Coconut is a dream. They are super gorgeous. We eat so much of Mango in India, you have no clue. My pops would peel the mango so neat that there will be one long strand of peel. There’s a reason why they call it the king of fruits. Love this my dear and your pictures as always are dreamy. I think we’ve all had moments when there’s been some egg shell in the muffin mix (or the meringue, mousse or lemon curd!). I guess at the end of the day it’s extra calcium, right?! If it helps, I made a shredded carrot salad tonight with chopped dates, pomegranate and roasted almonds. Whilst crunching down on a piece of ‘extra hard almond’ I thought to myself, “hm… maybe that was actually a date pit!”. To be honest, I’m still not sure what it was… but luckily, all of my teeth are still intact. These look so good! I cannot wait to try them. I have been looking for new recipes to try, and love your website!